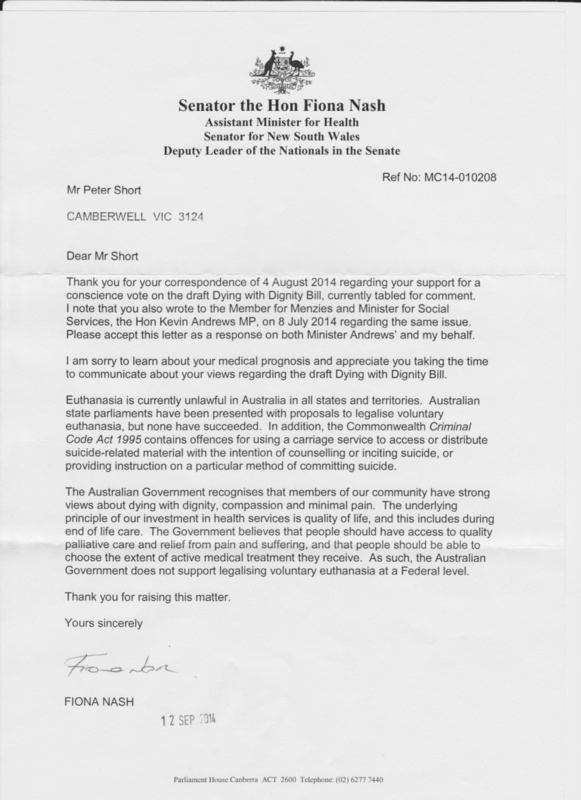 In response to my 8th July email to all the Senate and HOR members, I have recieved a response from the Deputy Minister for Health,Fiona Nash. As you can see, she is also responding on behalf of Kevin Andrews, who has the honour of reversing the Dying with Dignity bill some years ago in NT. She has put the Governments position. Have a read, and I would be interested in your thoughts. To me this letter is insulting and scary in terms of implications for a free and bipartisan debate followed by a conscience vote on the DiNatale Dying with Dignity bill. The last 2 sentences in fact make no sense at all in saying “people should be able to choose the extent of active medical treatment they receive. As such the Aust Govt does not support legalising voluntary euthanasia at the Federal level.” I would love her to look me in the eye and say she and the Australian Government thinks if it comes to it I should suffer intolerably! It should be a call to each of us insist that Tony Abbott responds to my call for 1/ Making comment on the petition and 2/ Supporting a conscience vote. Letters like this show complete disregard for transparency and the will of 80% of Australians. Feel free to contact your local member or the Prime Minister on my behalf. I am always up for a mtg just can’t get one. Click here to read the Assistant Minister for Health Fiona Nash’s response to my email from last month. Useless Peter, just a useless reply. What world does this woman live in? Having worked in both Fed & State Govt Depts I recognise this as bureaucratic gobbledegook. It says nothing other than, as you say, to scare. How very threatening to bring up the spectre of criminal charges. Why is it that “these” people in their ivory towers cannot see the vast difference between palliative care – wonderful if and when it works, and if this is what the individual WANTS! – and active, legal end of life for those who WANT/NEED it? Head in the sand the lot of them. No point in me writing to Tony again, all got was the same placating bumpf that you got – and it took over two months for Josh F to reply. I do see that there is continuing talk in the media with articles and letters advocating our cause, so – as is so often the case – the politicians are obviously at odds with what the majority of “ordinary” people believe and want. I also note that the “right to life” rent a mob certainly dominated the submissions on Sen D N’s Bill, as expected. Think the great Australian apathy got to those who support the Bill but just couldn’t be bothered in doing anything concrete to support it. Big sigh…….. think a G&T will help the mood. Ha ha. Passionate. We need to be a football team they seem to get attention. You must be really frustrated with this kind of rubbish coming from our so-called elected representatives. I am. I think the definition has lost its way over the years. Unlike Julie, I think a glass of red will better help the mood in my case. – Wilko. Yet another poppycock, bureaucratic response that blatantly disregards the majority who clearly want legislative reform. Possibly too scared to stand up for the majority for fear of losing her job. It takes courage to break out of the mold; even to write a response that has some warmth and sincerity would be a break through. interesting Nash has elicited the most comments, understandable. The veiled threats were annoying to say the least. I hope that both Fiona Nash and Kevin Andrews get Primary Progressive Multiple Sclerosis. Not only because they deserve it but because it will give them plenty of time to contemplate a most undignified and drawn out death which palliative care can’t do anything about.